Our black lab, Layla, is beginning her new career as a therapy dog at a nearby hospital. She is one of several dogs in a pet therapy program that dispenses love and comfort to patients, patient families and the staff. 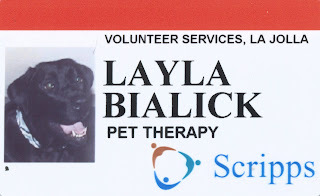 Today, Layla had her picture taken for her "official" volunteer name badge, which she wears with her blue service dog vest. I enlisted the help of Olive & Company, a fabulous etsy store, to dress Layla in a collar that reflected the ocean and (of course) matched my blue volunteer coat. 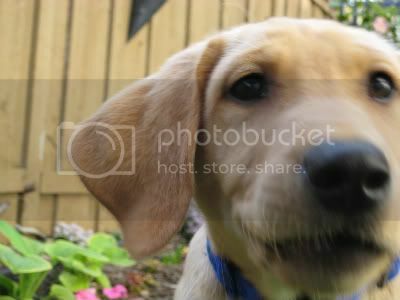 Layla is wearing Olive & Company's "Ocean Waves" collar (see picture above). I have to admit that I was excited about getting our name badges. Layla and I (both washed and styled) went to the hospital, parked the car and jumped out. People immediately began greeting us, complementing Layla on her good looks, the wind was blowing and I felt great! As I was checking out our reflections in the window, I realize that I had just stepped in the little pile of dog poop Layla had just donated to the hospital (lol). In honor of Layla's greatest adventure (to date), Laura and the good folks at Olive & Company are sponsoring a Sweet Dog GIVEAWAY! 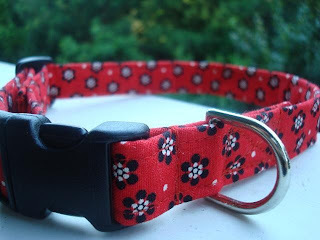 One lucky winner will win a custom Red Flower Power collar giveaway (pictured above). Laura will make the collar custom to your dog neck size. This is Olive & Company's first giveaway. Let's make it special by telling our friends about the giveaway! Post a comment on this blog post telling us your what is your favorite product in the Olive & Company store (1 entry). Please include your email address so we can contact the winner. If you do not have a Google account, select anonymous. The winner will be selected at random. Contest Ends 07/17/09. This contest has ended. Congratulations to our Sweet Dog Giveaway winner, Mindy. Thanks to all of you who participated in the giveaway and support this blog. I really appreciate it! Check back for more great product reviews and giveaways.